Dome offers a window to the world. With a quest to bring guests closer to nature the Dome experience aims to take people away from the crowds, away from their screens, and from the world of the everyday. Located at spots of stunning scenic beauty worldwide, Dome provides a compact and beautifully crafted living space with a unique 180 degree transparent window to the world. 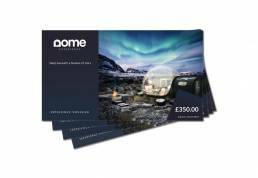 Truly exceptional, innovative and unique, Dome is an epic experience to remember, and VoucherCart are delighted to have been selected by Dome to deliver their gift experiences.